Having got bored with the usual breakfast menu, I was looking for a change. Something more filling and healthy was what I wanted. That is when I came across someone's post of Quesadilla on FB. Not that I had not seen it before. But it never occurred to me that I could make this super easy snack at home whenever I wanted instead to buying it from outside everytime. That way I could also decide what filling I wanted to put inside it. EVOO for brushing the quesadillas. Preparation- Take the flour in a wide plate. Add salt, pepper and butter. Rub in. Add milk to the flour, little by little and keep on mixing so that it is well incorporated into the dough. We want a soft dough. It is ok if it is slightly sticky but too sticky means more flour should be added. Cover dough with moist cloth and rest aside for 30 mins. Cooking - Heat the olive oil in a frying pan. Add the vegetables to it and sprinkle pepper and salt. Saute on high for 2 mins max. Keep aside to cool down. Pinch small balls from the dough. Dust a working surface with flour and roll out into thin circles. Heat a tawa/flat pan. Put the roti/tortilla on it. Wait till small bubbles begin to form. Add some of the stir fried veggies to one half of the circle. Sprinkle mayonnaise and cheese on the veggies. Fold over the other half so that the veggies and the cheese are sandwiched inside. Slightly press with a splatula for 1 minute or so to allow the cheese to melt from the heat. Brush some olive oil on the side. Flip over and brush more olive oil on the other side. Cook for 30 seconds. Remove from tawa and keep aside. Repeat with the remaining dough and veggies. Serve hot with a hot sauce/sour dip of your choice. Wholesome and lovely looking quasadilas. I agree that it's a very exciting menu. Wonderfully prepared. 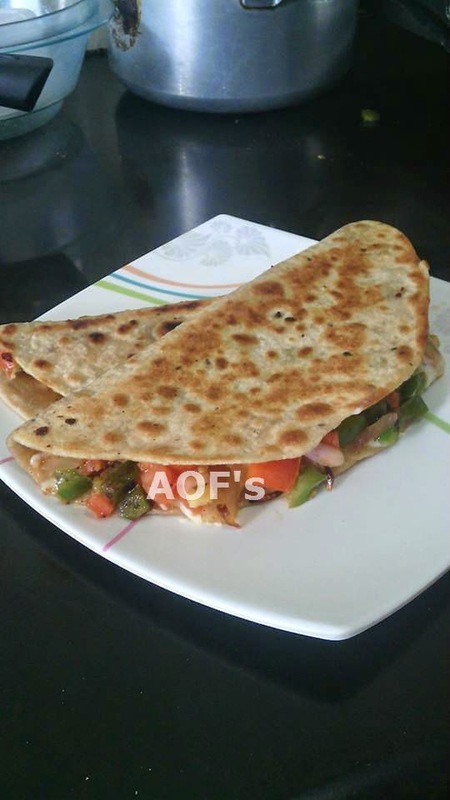 Excellent and very easy quesadillas..Love to start my day with..